Great for Cinco de Mayo celebrations, or summer entertaining, these frozen watermelon raspberry margaritas are light, fresh and so easy to make! Great for parties, your friends will love them! Happy almost Cinco de Mayo! This year I’m celebrating by rehashing some of my all-time favourite recipes from 2017! I first made these watermelon raspberry margaritas last 4th of July! I can’t actually remember what we were doing last 4th of July, but pretty sure we had a super low key day! This 4th of July however, we are off to London and Latvia for two weeks and I am SO excited! But that’s another story! Let’s talk about these frozen raspberry margaritas with watermelon! Everyone needs a killer margarita recipe, and I am here to help today! This recipe is actually so, so easy to make and it lovely and fresh! I thinking now, backyard patio or porch, margarita in hand, pork in the slow cooker for carnitas tacos, bliss! C’mon summer! Hurry up, please! One of our favourite things to do in the summertime is to go berry picking. The raspberries in Oregon are insanely good, aka great for making margs! While I don’t have the luxury of berry picking right now, these margaritas are great using fresh or frozen raspberries from the supermarket. These frozen raspberry margaritas are so refreshing and light and require 5 simple ingredients – watermelon, raspberry, tequila, lime juice and ice. Seriously, how easy is that! 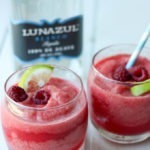 I haven’t tried, but I reckon these would be so, so SO good too if you wanted to substitute the tequila for vodka and have a frozen raspberry watermelon slushie instead! OMG. But anyways, you guys should def have a crack at making these, they are so delicious and would be perfect for Cinco de Mayo celebrations, 4th of July parties, or as every day, warm weather cocktails! And remember, tag us on Instagram @thehomecookskitchen for a chance to have your photo featured! 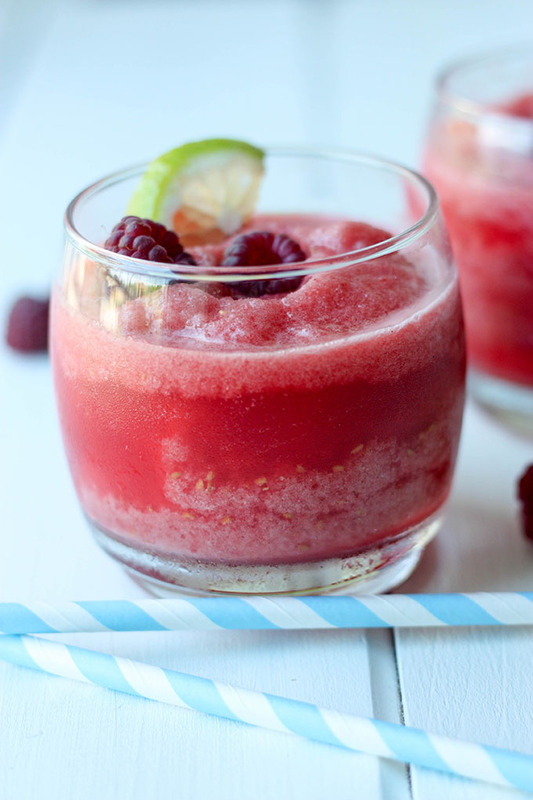 These frozen watermelon raspberry margaritas are perfect for the summer time! Light, refreshing, delicious and SO easy to make! It'll be a huge party pleaser! 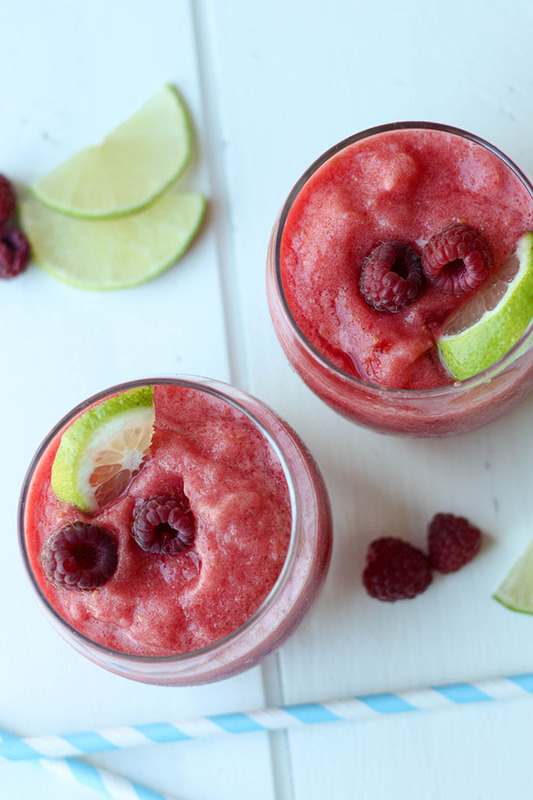 Place raspberries, watermelon, ice, lime juice and tequila in a blender. Blend until well combined. Add more ice if desired. Garnish with raspberries and a slice of lime. 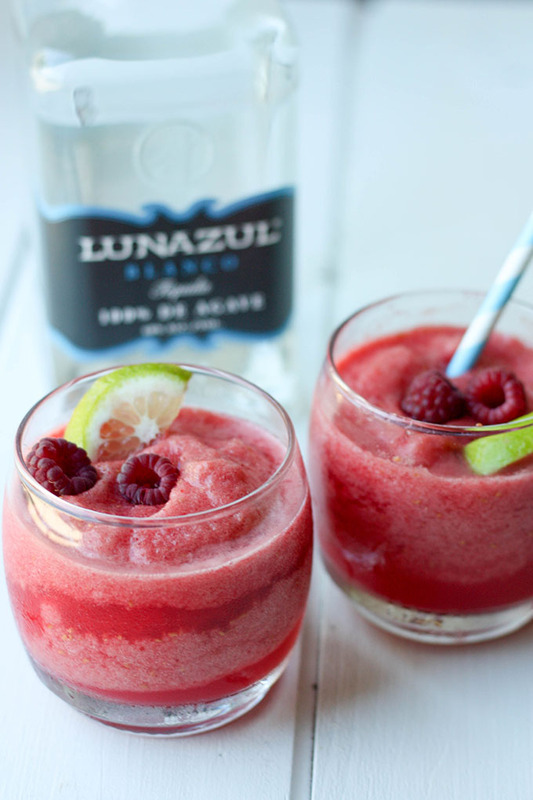 Swap out the tequila for vodka for a fresh vodka raspberry slushie! This recipe originally appeared on THCK in July 2017 and has since been updated. The recipe is still the same fabulous recipe! This sounds AMAZING! And how awesome that you picked the berries yourselves! These are definitely my kinda margaritas!! I love the frozen kind… they actually are much better on my heartburn somehow lol. These are so awesome!! I loved your grapefruit margaritas, so I’m sure I’ll love these too. Such a perfect summer drink!! yasss!!! thanks Milena! These are really good if I must say so myself 🙂 We picked so many raspberries the other day I had to do something with them! Wow! What a lovely cocktail recipe for these hot summers!! Cool and refreshing! Perfect! Thanks Deepika! i love this cocktail, and so easy to make! I used my ninja to blend everything up! thanks Allison! they are so refreshing! This sends me right back to summer! (It’s -15C out right now here where I am currently) haha but I can still have my tropical refreshing drinks pretend it’s summer by bumping my thermostat very high right? 😀 Love this! urgh -15C I can’t even begin to fathom that weather right now! the thermostat is always a good idea! and if that fails, a holiday to Mexico??? I love the flavors here and love that you use REAL FRUIT! Must taste fabulous! Oh my goodness this look absolutely amazing! It truly looks delicious! I can’t WAIT to try this! This is absolutely fantastic!!! One of my favs! Thank you for this great recipe! YUM! thanks Veena! it’s gorgeous for the summer! Watermelon, blueberries and lemon….that is an interesting combination. I would have to try a non alcoholic version of it. Will be great for summer. no blueberries! just raspberries and lime! the combination is fantastic even without the alcohol! London and Latvia!? I’m so jealous!! I’ll have to drown my sorrows in one of these frozen margaritas. This is SO my kind of drink – dangerously so! it should be an amazing trip! so excited!!! ha ha if you like margs you’ll love this recipe!! Georgie! These are beautiful! Margaritas are my favorite, especially when they’re such a pretty color :). I can’t wait to hear about your trip–July is coming up fast! Have a great weekend! thanks Kelsie!!! isn’t the colour gorgeous i love it!